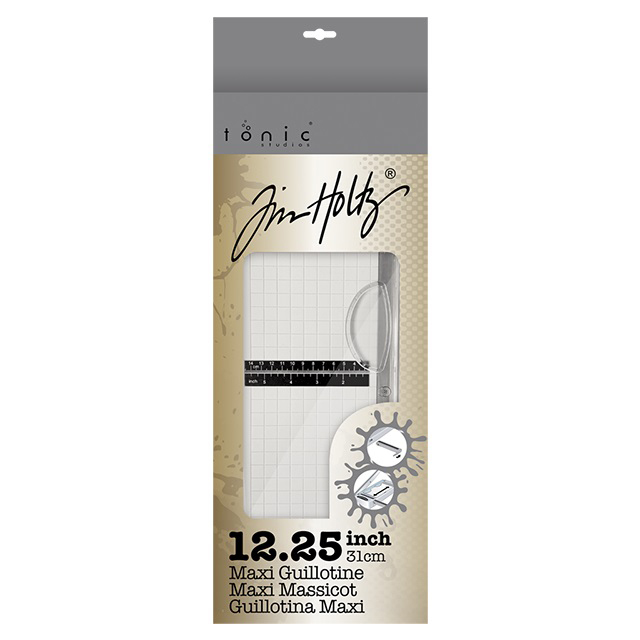 Cut precisely with the 12.25" Maxi Guillotine Trimmer by Tim Holtz for Tonic Studios. 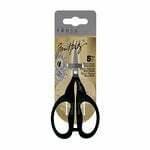 The trimmer features a soft grip handle for comfort and a hardened stainless steel precision ground blade and accurate grid designed for cardmakers. The trimmer can cut a length of up to 12.25" and has markings for 5.5" in width. 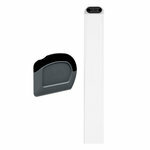 There is a magnetic recess area for storing paper clips and a spring-loaded finger bar for safe paper holding. The trimmer also has a removable extension arm that stores underneath for creating with 12" wide pages. I've had my trimmer for about a week. Have wanted a guillotine trimmer for a long time. 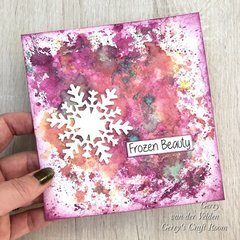 Was previously using the Stampin Up rotary trimmer. I'm very hopeful this trimmer will eliminate the rough edges of cut cardstock. So far it is cutting beautifully! On the bed of the cutter there are little grooves at each 1/2" - my suggestion would be to have markings at each 1/4". My previous rotary trimmer also had a scoring blade so I am missing the ability to cut and score on the same tool but I guess I have to give that capability up to get clean cuts. I like the idea of a guillotine trimmer....but somehow I keep going back to my wire Fiskars. This guillotine is great EXCEPT it is difficult to get exact measurements every single time. The only good measure is at the top which, in this long trimmer, feels really far away! The bottom does not have a lip to hold paper steady nor a really good ruler. I have a feeling that this will also be going onto my pile of misfit trimmers to be donated. I'll probably be back to my Fiskars wire trimmer within the week. Sigh. Wish I had held off on this purchase. Very disappointed that there is no 1/4 inch grid on the base of the trimmer. They have it for the 8.5.x11 trimmer but not for this one. I feel like I wasted my money. 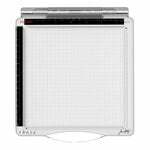 Great paper trimmer...accurate, lightweight, east to use! 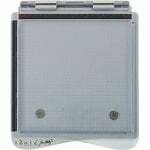 I have a heavy duty commercial paper trimmer but it's bulky, very heavy and takes up a lot of room in my craft studio. I wanted something that would store easily, with a smaller footprint and still cut accurately. This new Tonic trimmer is perfect. I store it under my work table and just pull it out when needed. The set-up of the extension arm is easy and it is extremely accurate. I make intricate cards and have had no problem with 1/8" measurements when cutting. It does a good job on everything from printer paper to heavier watercolor paper. I still need my big cutter for chipboard, etc. but the Tonic has become my day-to-day trimmer. It's become my favorite new tool! This works so smoothly with the double pressure plates and is so much lighter. Im looking forward to using it everyday too. I am very pleased. Have had the smaller one for some time, and was so pleased when the 12" one came out. Finally, a larger paper cutter. I love &#128151; it! 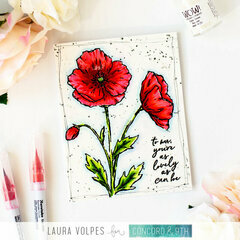 Thank you Tim Holtz!!! How many sheets of 80 or 100 or 110 lb. card stock will it cut with one pass? By: maryluddite78 (11-Apr-18) Helpful Question? Yes | No Thank you! Report Inappropriate This question has been reported. Thank you! 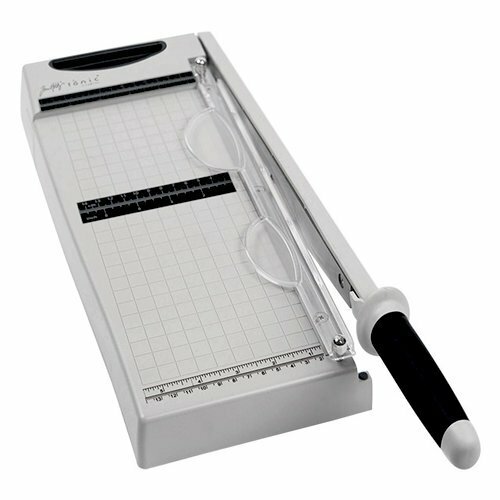 I tested my Tim Holtz-12.25 inch Maxi Guillotine Trimmer for you. I tried my test on 110 pd. card stock. I cut 6 out with no trouble. Tim said in his u-tube a couple of sheets. Tim is correct when he said a couple of sheets, because it cut like butter with 1 or 2. I had to use a little more mussel to bring the blade threw all 6. The cutter is not as beefy as the one I replaced with this trimmer. I thought it might be as strong, thinking they probably are pretty much the same. I was wrong, this is more light weight. What caught my eye on this one was because its narrow. My space in my craft room is so limited that I liked that it doesn't take up space like the big ones. 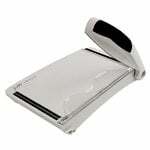 It has a arm that will pull out if you need it for a 12 by 12 sheet of paper, but than you can push it right back in. I would not call this a commercial grade cutter, so if that's what your looking for than this wouldn't do, craft at home than this is for you! 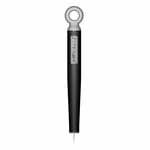 Hope I helped in your finding the right cutter for your projects! By: hoag (16-Apr-18) Helpful Answer? Yes | No Thank you! Report Inappropriate This Answer has been reported. Thank you! I am looking for a trimmer that will cut paper 1/4" or 1//8 " wide...I do paper quilling and wondered if will this trimmer do that ? Carol-Lynn By: Carol-Lynn (22-Jun-18) Helpful Question? Yes | No Thank you! Report Inappropriate This question has been reported. Thank you! 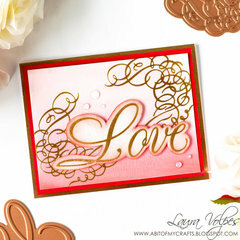 Yes, it will cut paper into 1/8 or 1/4” strips. By: pblanton16 (23-Jun-18) Helpful Answer? Yes | No Thank you! Report Inappropriate This Answer has been reported. Thank you! Is this a self-sharpening blade? Or is some sort or replacement or maintenance required? By: amyskreations (22-Jan-18) Helpful Question? Yes | No Thank you! Report Inappropriate This question has been reported. Thank you! From what Tim Holtz said (either in his Creativaton Tonic Sneak preview or at Creativation 2018) it's similar-self sharpening., I think he meant that he's used his a LOT and hasn't had to replace the blade. Hope this helps. By: kahobel (29-Jan-18) Helpful Answer? Yes | No Thank you! Report Inappropriate This Answer has been reported. Thank you! This trimmer actually "shears" the paper. The metal on the handle is not sharp like a traditional paper trimmer. So if you were to grab the cutting arm, you will not cut yourself. This is especially good if you have children in your house as it is much safer. This trimmer cuts clean and straight. It will cut two of 80 lb card stock sheets at a time. If you have any additional questions, please call 844-866-4287. By: Tonic Studios (30-Jan-18) Helpful Answer? Yes | No Thank you! Report Inappropriate This Answer has been reported. Thank you! Will it measure at 1/16th of an inch?? And I assume the 6 inch is at edge of base but where does 6-1/8 cut at? By: Rosemarie R (27-Sep-18) Helpful Question? Yes | No Thank you! Report Inappropriate This question has been reported. Thank you! It does measure in 1/16th increments—don’t see any 6” measurements. By: EvelynC (01-Oct-18) Helpful Answer? Yes | No Thank you! Report Inappropriate This Answer has been reported. Thank you! Will this cut through chipboard? By: Ling1323 (22-Mar-18) Helpful Question? Yes | No Thank you! Report Inappropriate This question has been reported. Thank you! No, It will only cut through very lightly chipboard. By: Tonic Studios (22-Mar-18) Helpful Answer? Yes | No Thank you! Report Inappropriate This Answer has been reported. Thank you! Will this item be in anytime soon? :) By: leateach (19-Mar-18) Helpful Question? Yes | No Thank you! Report Inappropriate This question has been reported. Thank you! They are in stock today. 03/21/18. By: readysetstamp (21-Mar-18) Helpful Answer? Yes | No Thank you! Report Inappropriate This Answer has been reported. Thank you! When will this item be available? By: cherylhewak (15-Feb-18) Helpful Question? Yes | No Thank you! Report Inappropriate This question has been reported. Thank you! This item arrives in the Tonic warehouse approximately March 8th. S.com should have it by the following week. Gary By: Tonic Studios (16-Feb-18) Helpful Answer? Yes | No Thank you! Report Inappropriate This Answer has been reported. Thank you!